Reenactors from Washington, Oregon and British Columbia braved intense heat and yellow jackets for the fourth annual Encampment at English Camp on August 24-25. The event commemorates the peaceful joint occupation of San Juan Island by British and American forces from 1859 to 1872. More than 80 partner re-enactors from Fort Langley, Fort Rodd Hill, New Westminster, and Esquimalt, all in British Columbia; Fort Nisqually near Tacoma; and Corvallis, Oregon, joined with San Juan Islanders in staging the two-day exhibition that featured recreations of Royal Marine camp life, period crafts, demonstrations of music, blacksmithing, sewing, and carpentry, along with the pageantry of period uniforms in scarlet and blue. Highlights also included spinning and weaving demonstrations from the San Juan Island weavers and a formal Candlelight Ball with local contra dancers accompanied by Sugar on the Floor. Royal Marines start the day during Encampment 2002. The British troops await the raising of the flag. The entire camp, including civilians, assembles on the parade. Captain Bazalgette and the ladies await the opening of the ball. Sam Watkins treats a young visitor to a game of chess. Surgeon Seddell (John Harper) awaits a few brave patients at day's end. 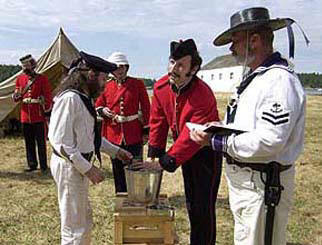 The rum ration is always a popular event among visitors and re-enactors alike. Simon Sherwood of Vancouver, BC does the honors. English Camp or British Camp? County road signs call it "British Camp," while rangers and the latest park literature refer to it as "English Camp." 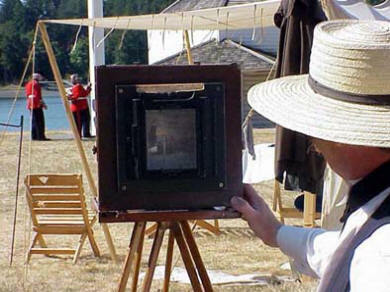 Which is the proper name for the northern unit of San Juan Island National Historical Park? And why is there so much confusion over it? The United States Army had already established a post near the Hudson�s Bay Company�s Bellevue Farm on the southern end of the island during the height of the crisis in late summer 1859. 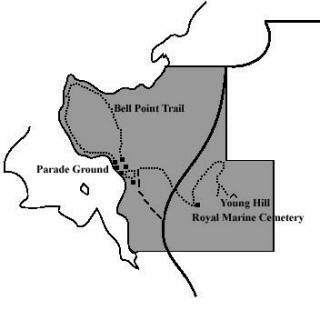 Therefore, in March of 1860, a company of British Royal Marine Light Infantry built a similar sized post on Garrison Bay, about 15 miles north. What did the British call their tidy camp, nestled on a placid bay frequented by all manner of seabirds and stocked with an abundance of shellfish? Historical evidence appears to favor the name "British" over "English." For more than 12 years, the installation appeared in British documents interchangeably as "the British Garrison," the "Detachment of Marines," or "The British Forces at San Juan." 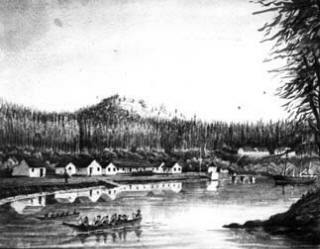 It also was referred to as the "British Post" or "British Camp" by its second commander, Captain Delacombe, in his correspondence with Whatcom County�s justice of the peace. And it was labeled "British Camp" on an 1872 British Admiralty map. However, in 1951 a U.S. Coast and Geodetic Survey special report stated that "...this �historical site� is referred to as �English Camp� in common usage, and there is evidence that �English Camp� has been the spoken name in use on the island for the past 100 years..." regardless of what the official name was during the joint occupation. Thus, since 1954, it has been labeled "English Camp" on all U.S. Geodetic Survey maps. San Juan Island National Historical Park, in an effort to be accurate in interpreting historic events, took a different view. Recognizing official British documents�and also the fact that the marines� ranks were comprised of men from Ireland, Wales and Scotland, as well as England�decided to rename the unit "British Camp" just as it was known to the British Admiralty. The name change met with a mixed response from the island community. Many familiar with the history and the mixed nationalities of the marines were happy with the change to "British Camp;" while many more, used to calling the site "English Camp" (some for most of their lives), were considerably less enthused. A spirited debate ensued until December 1992 when the Department of the Interior�s Domestic Geographic Names Board decided in favor of "English Camp." As a result, "English Camp" will replace "British Camp" on all signs, interpretive displays, brochures, charts and maps of the area. Because of the sheer magnitude of the task, a complete switch to the officially approved name will take some time to accomplish. In the meantime, please excuse the inconvenience and realize that no matter the current name of the camp, it was peacefully occupied from 1860 to 1872 by the British Royal Marine Light Infantry � or the Royal Marines. English Camp -- Lies on tree-sheltered Garrison Bay, about nine miles northwest of Friday Harbor. Four historic buildings and a small formal garden have been restored. The barracks has the same laser disc program as American Camp. Buildings are open daily during the summer season. A self-guiding history walk is scheduled to open in the summer of 1999. Booklets will be available at the trailhead, just off the parking area. So, ye wants tae be a Jolly/Tar? one pound of salt beef plus nine ounces of flour, three-quarters of an ounce of suet and one and a half ounces of raisins which were used to make 'duff'. three-quarters of a pound of preserved beef (corned or stewed in cans) and either four ounces of rice or preserved potatoes or two ounces of rice and two ounces of potatoes. This was served at 6.30 am, ends at 7.00 am. It consisted of a pint of cocoa or chocolate, without milk, and ship's biscuit. This was served at Noon. Beef was issued one day and Pork the next alternating continuously. Of course, there was also ship's biscuit. Served at 4.30 pm, ends at 5.00 pm. This was one pint of tea, without milk, and ship's biscuit. The basic ration, assuming it was actually all edible, provided around 4,000 calories per day. Today this is considered to be about three-quarters of the daily calories required by a hard-working man. There were also many times at sea or serving with the Naval Brigade ashore, when sailors had to go on half-rations to eke out the food supply. These facts explain the tradition of going for a 'Mighty Feed' on the first day of shore leave. These rations were supplemented by fresh meat, fish, fruit and vegetables bought or acquired by the men themselves. Live cows, pigs, goats, sheep and chickens were carried on board to give fresh meat and milk. It must be noted that officers drew the same ration as the ratings but, of course, they could afford to supplement their official rations with a much wider range of bought in extras. A eighth of a pint of neat rum (around 70-75% alcohol by volume) was issued to each man per day served in two equal measures after Dinner (noon) and Supper (4.30 pm). Ratings below Petty Officer rank had theirs mixed one part rum to two parts water to make 'grog', Petty Officers had a one to one mix of rum and water and Officers got theirs neat. There were very strict regulations to stop men saving up rum rations and then binge drinking. Also when you first enlisted you were asked if you wished to be temperate (marked with a 'T' on the ration list). If you didn't take the rum ration, you got an extra three pence a day allowance in lieu added to your wages. There were eight men in each mess of the lower deck. One man was elected as cook for the week and he collected the food as it was issued then' prepared' it as best he could. Each lump of meat was marked in some way to distinguish it as belonging to that mess. Some had buttons tied to it, some had different coloured rags or knotted ropes attached. This all went into one large copper in the galley for cooking. Any vegetables, pease pudding or duff were put in a canvas bag labelled with the mess number and boiled along with the meat. When in harbour the meat was roasted or baked rather than boiled. Each man had the following mess kit: one iron spoon, one tin mug, two tin plates and one tin bowl. They used their 'Pusser's Dirks' (everyday penknives) to cut their food and forks were not issued until 1907. The Victorian Royal Navy used two time-keeping systems, the watch system and the 'civil' system. The Navy did not adopt the twenty-four hour clock until the twentieth century. In our period the twenty-four hour clock was referred to as the 'continental' system. This applies to all watches except in the Last Dog watch 6.30 pm is 1 bell; 7.00 pm is 2 bells; 7.30 pm is 3 bells but 8.00 pm is 8 bells. During the 'Silent Hours' after the order 'Pipe Down' and before 'Lash Up and Stow Hammocks', i.e. 10.00 pm to 5.30 am, the bell is not struck so as not to disturb those of the ship's company who are asleep. Most days were organised as set out below but some days had different duties or 'tricks' added. Normal routine until after breakfast. Then the whole crew donned their best uniform and mustered in their divisions for inspection. The Captain and officers then checked uniforms and kit and examined all the ship for dust or other faults. During the two hours of the inspection the men stood silent. Then this was usually followed by a one hour church service given by the Chaplain (if the ship had one) or the Captain. Morning - Small arms and 'field' training for the landing party. The rest of the crew had a break from sail training as the landing company took up the deck space. Afternoon - 'Make and Mend'. A sort of half-day holiday in which the crew could chat and officially make new clothes and mend their old ones. When we are doing re-enactments with the infantry of The 1879 Group, we are often asked why we do different drill movements to the 24th Foot regiment which they portray. The most commented instance is the command "Shoulder Arms". You can see by the two illustrations below that there is a subtle difference between the seaman and the soldier. The reason for this is that as the Royal Marines drill as 'Light Infantry' (like the Light Infantry regiments and Rifle regiments) and so does the Navy. The line infantry march at the slope and so their version of 'shoulder arms' leads to 'slope arms' as the next order. The light infantry march at the trail so their version of 'shoulder arms' leads to 'trail arms' more easily. Those who know line infantry rifle exercises will recognise the light infantry's 'shoulder arms' position as 'advance arms'. The other most noticed difference is that the Royal Navy and Royal Marines, along Light Infantry & Rifle regiments, are equipped with sword bayonets or cutlass bayonets whilst the other regiments of the Army reverted to the shorter socket bayonet. So the obvious command used by us is "Fix (or unfix) Swords" rather than "Fix (or unfix) Bayonets". The one light infantry exercise that neither the Royal Navy or the Royal Marines adopted was the fast pace of their quick march! Thank God. One of the other things that members of the public have commented upon is our saluting. Unlike the Victorian (and modern) Army which always salutes with the right hand, the Victorian Royal Navy's saluting regulations were a little more complicated. A seaman is simply to salute with the hand farthest away from the officer, unless the officer is directly in front of him in which case he uses the right hand. Also if a sailor is not wearing a hat he stands to attention without saluting. When a sailor is carrying a rifle he comes to the 'shoulder' position and salutes by 'bringing the left hand up level with the elbow and tapping the rifle with his open palm'. If a seaman is working he stands to attention and salutes BUT if he is working under the command of an officer of higher rank than the approaching officer he continues to work. Finally if an officer approaches with his hat under his arm, this is a signal that he does not want to be officially recognised and so a sailor does not have to salute him -- but only if this is the custom on board that particular ship! So when explaining to an ex-soldier at an event who said our saluting was a shambles: I used my left hand & my crewmate used his right because the officer was to my right and in front of him. Our other crewmate stood to attention and did not salute because he did not have his cap on. It is simple enough, honest.